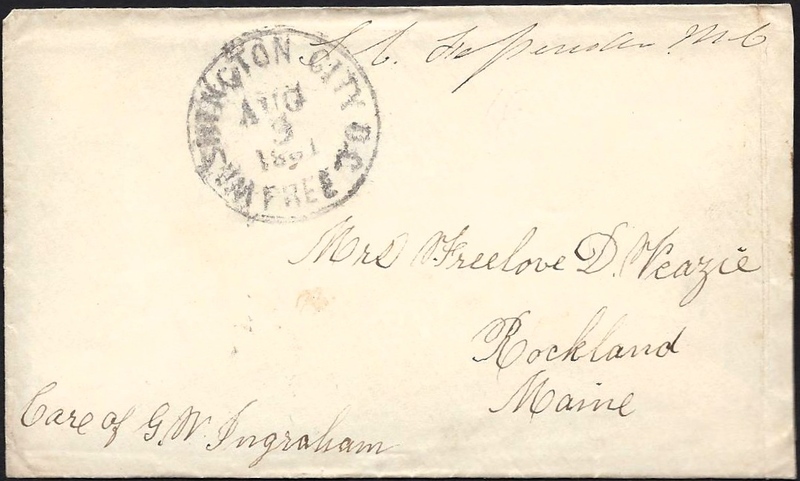 This letter was written by 30 year-old Abiezer Veazie, Jr. of Rockland (1831-1890), Knox County, Maine who enlisted 17 May 1861 in Company C, 4th Maine Infantry. This company — known as the Rockland City Guards –was commanded by Capt. E. Walker. After a month of drill in Rockland, the company went with the regiment by steamer and rail to Washington D. C. accompanied by the Rockland Brass Band, arriving on 20 June 1861. 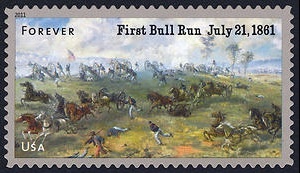 The 4th Maine was ordered to Bush Hill near Clermont, Fairfax County, Virginia, on 11 July 1861. The Clermont Plantation was owned by Capt. 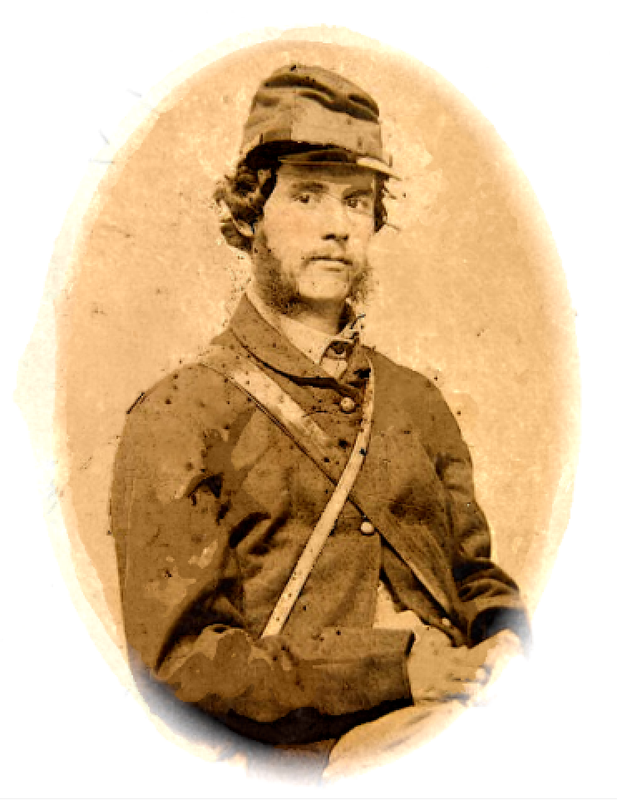 F. Forrest, U.S. Navy (later Confederate Navy), and was located between the Orange & Alexandria Railroad and the Old Fairfax Road. When the men of the 4th Maine finally crested Chinn Ridge west of the fighting around the now famous Henry House Hill, their ranks were decimated by hard marching through intense heat and humidity. According to after action reports, some companies had as few as eight men still in the ranks that started the day with 60. Unfortunately for Howard’s brigade, they arrived on the field just as fresh Confederate troops arrived. With their M1816 muskets (converted to percussion), the boys of the 4th Maine traded some twenty volleys with the Confederates from a safe distance of 2 or 300 yards, firing blindly through the thick smoke that hung on the battlefield, fearing every minute their position would be overrun. When Howard went to the rear to bring up his reinforcements, he found them in total disarray, hunkered down in a pine thicket. He managed to bring some of these men into the action but orders misunderstood resulted in a general retreat that turned to panic and a “skedaddle” that did not end until the regiment was back in Washington D. C.
Veazie later served (from February 1862 to March 1865) as a wagoner in Company B, 1st Maine Cavalry. He married Freelove D. Richards (1827-1896) in 1851 at Hope, Knox County, Maine. For most of his life, Abiezer worked as a teamster at a rock quarry in Rockland, Maine. I received your letter of the 28th and was glad to hear from you. I think it done me the most real good of any letter that you have written since I left home. I was on guard when the mail arrived and O. Brown brought it to me. I think there must have been considerable excitement in Rockland for I got a letter from Sam before I got one from you. Don’t you wonder at that now. He said according to Col. [Hiram G.] Berry’s report that ¼ of the regiment was killed, wounded, and missing & if such was the case, they had cause for excitement. ¹ It is bad enough as it is. The Southerners report that they killed about two thousand but the correct report is between 300 & 500 killed, wounded & missing. We are all well and especially our Meadow boys and we are counting on the time when we shall get home. You spoke of losing sight of me & thought I must be dead but we must not distrust God for He has been with us and He still is with us and He’s promised to be with us to the end. You spoke of the love of my letters. I assure you that your letters are dear to me and I can see you as plain today as if I were with you and when I look at your miniature, it seems as if I were looking you in the face. It has not seemed like Sunday since I left home but I feel that God will overlook all our imperfections. Do not give yourself any trouble about me. You spoke of your giving me to think sometimes that your love was so strong as at first, but don’t never say so again for I feel assured that your love for me is as good as ever, judging by myself. We hear that a decisive battle was fought yesterday. The rebels lost 1500 men while our lost 600. However, I think that if this question is settled by fighting, it will be a longer war than many of our Northern men thought for many (and I among the rest) thought by September the war would cease and peace would reign again in our country. But people here think that a compromise will be made. The people of New York are holding peace meetings all over the state and I understand that the citizens of Maine think quite differently of the war from what they did when I left. We shall not have another battle very soon. I think our boys do not feel quite so fierce to meet the rebels as they did before the Battle of Bulls Run. They think that they have not been used just right and none of us have been sworn into the service as yet and they say that they never will be. I think that there is not a dozen men in this regiment that will be sworn into the service — it is so different from what they expected. The weather is very hot here and still the men enjoy good health. We miss poor old Jarvis, I tell you, for he was the life of the whole regiment. Be assured if I am sick, I shall not fail to let you know if it is anything of consequence. I think if letters will cure you, I will write every day. As for sending franked letters, we send all we can get. I was glad you sent those envelopes and yet this morning I begged an envelope to save those you sent me. If you want to send me something by Jont, you may, but I can think of nothing unless you send me a better miniature looking more like yourself. This will do very well but it is rather dark. If Jont comes, you send a letter by him. Did you get the letter I sent by Mr. Pitcher? I have received eight letters from you. You spoke of a certain letter. I have burned them all but the two last. When I spoke of not trusting certain persons to far, I meant for the sake of the speech of people. Don’t see the cow if you can help it. This makes 4 letters I have since the battle to you and one to James Ingraham. So goodbye for a little while. I guess I’ll send that mottoe I spoke of in my last. ¹ The 4th Maine suffered 26 killed, 46 wounded, and 121 missing.